Higher Nature Mum-2-Be health supplement for when you are pregnant because it’s difficult enough getting all the right nutrients, provides all the vitamins & minerals important in pregnancy. 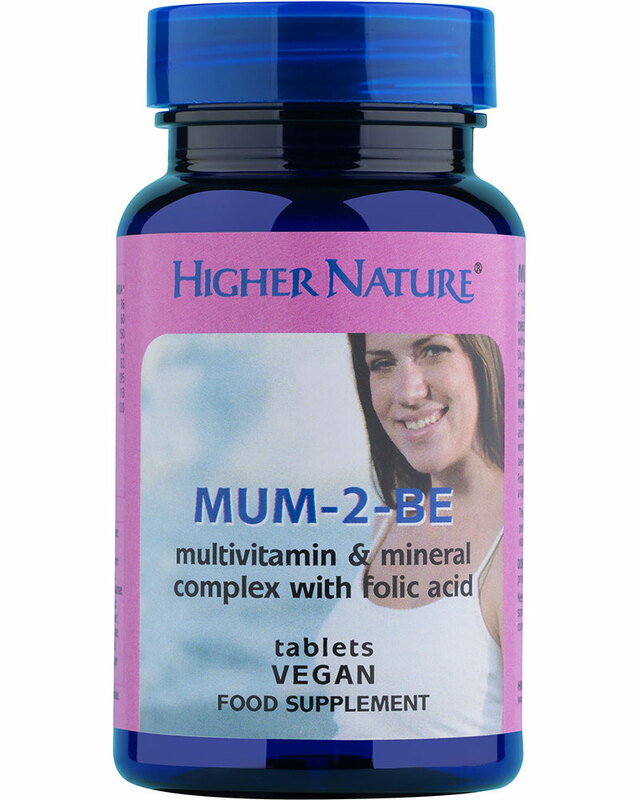 Most experts recommend a good multi when you are pregnant because it’s difficult enough getting all the right nutrients with our busy lifestyles, even when not expecting.The Mum-2-Be health supplement provides all the vitamins and minerals so important at this demanding time. Includes Folic Acid. A daily Omega 3 Fish Oil or Flax Seed Oil is also recommended as are additional Calcium and Magnesium for healthy teeth and relaxed muscles. May not be suitable for people with a fish or crustacean allergy. 7.5µg Vitamin D (300iu), 60mg a-TE Vitamin E (90iu), 322mg Vitamin C, 50mg Thiamin (Vitamin B1), 50mg Riboflavin (Vitamin B2), 90mg NE Niacin (Vitamin B3), 9.9mg Vitamin B6, 405µg Folic acid, 15µg Vitamin B12, 75µg Biotin, 75mg Pantothenic acid (Vitamin B5), 519mg Calcium, 5mg Iron, 225mg Magnesium, 15mg Zinc, 45µg Iodine, 45µg Selenium, 3.9mg Manganese, 45µg Chromium (picolinate), 90µg Vitamin K, 4.5mg Beta Carotene, 1.5mg Boron (sodium borate), 30mg Choline, 30mg Inositol. Wheat, gluten, lactose, dairy products, artificial preservatives, colours or flavourings.